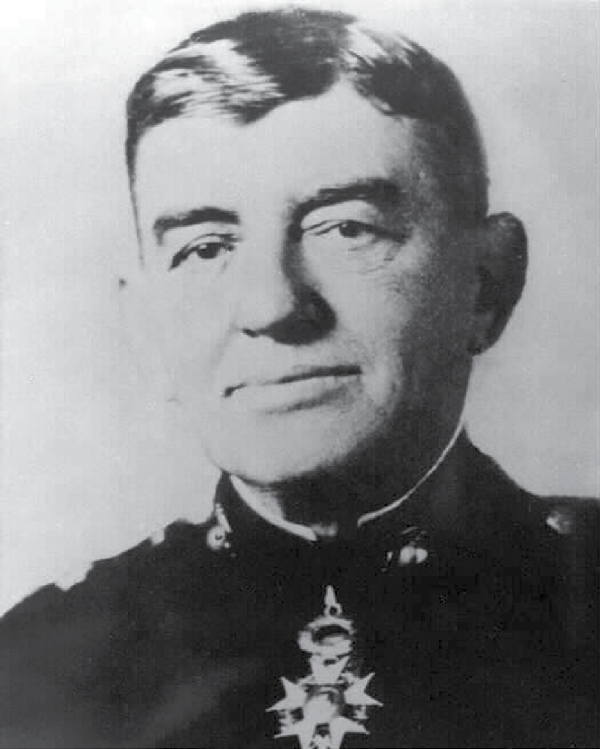 While a lieutenant colonel, LtGen John A. Lejeune, the13th Commandant of theMarine Corps, was a member of the executive committee forming the Marine Corps Association in 1913 and drafting its constitution and bylaws, which remain the cornerstone for MCA&F operations. “Scarlet and gold” oozes out of every nook and cranny of Bart­lett Hall. Sporting a cherished post office box of “1775,” most of the 108 full- and part-timers at the Marine Corps Association’s quaint headquarters at Quan­tico, Va., aren’t Marines. Yet, they are as much Marine as anyone who has stood on the “yellow footprints” at boot camp or completed The Basic School. The Marine Corps will celebrate nu­merous 100-year anniversaries of its units, installations and battles in the 21st cen­tury. Commemorating its 100 years of service this month, the MCA has been around longer than most service organi­zations. It has more service stripes than every major Marine base, including Quan­tico, and all of the Corps’ air and ground combat units. Marines formed the MCA in 1913 before the Corps had recruit depots, tin hats, tanks and dive bombers. The nation had barely 10,000 Ma­rines. It was a time when field-hatted Marines sailed in large Navy ships, shot well, marched often and landed in small boats to skirmish in strange places. Back then, who could have imagined 182,200 Marines or fights like Belleau Wood, Wake Island, Iwo Jima, Chosin, Con Thien and Fallujah? Top: MajGen Edward G. Usher III, MCA&F president and CEO, far right, along with sculptor and artist, Marine veteran Mark Austin Byrd, presents the newly established MCA&F sponsored 1stLt Baldomero Lopez Honor Graduate Award for TBS honor graduates to the TBS commander, Col Dale Alford, in 2012. Since 1913, the Marine Corps and its Association have grown up together. In fact, the Corps controlled and staffed the MCA for 60 years before the Pentagon required that MCA become a private entity in the 1970s. 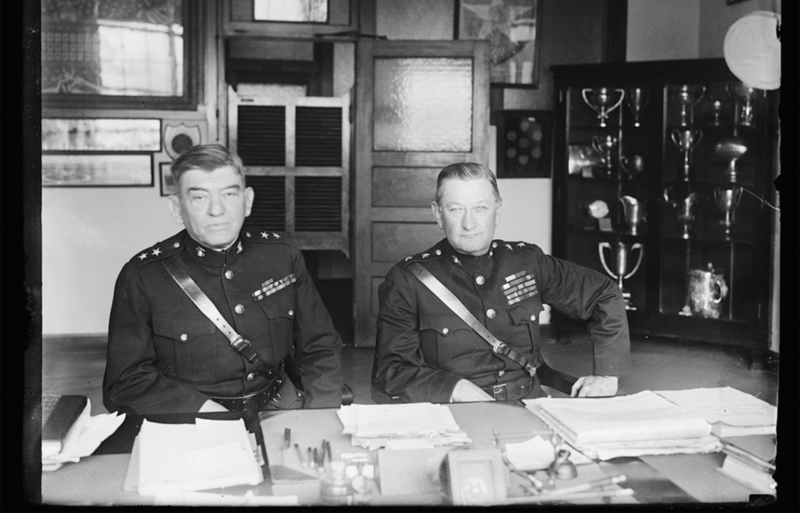 Governing board meetings were held in the Marine Commandant’s office for years, and he was the senior member. Some Commandants even wanted the names of nonmember officers and those delinquent in their membership dues. Those days are long gone. 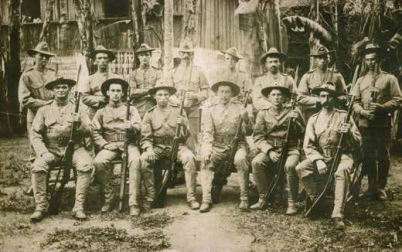 When Lieutenant Colonel Lejeune com­manded the Marine Barracks in Brooklyn, N.Y., from 1911 to 1914, he left his family to make expeditions to Panama, Veracruz, Mexico and Cuba. On Feb. 20, 1913, he sailed with the 2d Provisional Marine Brigade for Guantanamo Bay (Gitmo), a frequent jumping-off spot for Caribbean hot spots. Two years before, the officers of a similar Marine brigade at Gitmo voted and contributed $5,000 to form the Marine Corps Association, but the action was not formalized. On April 25, 1913, Lejeune was named head of a three-man executive committee, and the MCA was born. The goal was the professional advancement of Marines and the preservation of the Corps’ history and traditions. Those simple but vital goals remain to this day. Despite mostly imagined threats to the Marine Corps’ existence in 1913, the MCA’s founders gave it an internal mis­sion of developing Marines. Unlike many service associations, the MCA does not have a political role and never has lobbied Congress. Bartlett Hall is slightly more than three miles from Quantico’s main gate. Nestled barely inside the base, the three-story red-brick building sits next to Quantico town, within easy walking distance of Little Hall, the Marine Corps University and other familiar landmarks. 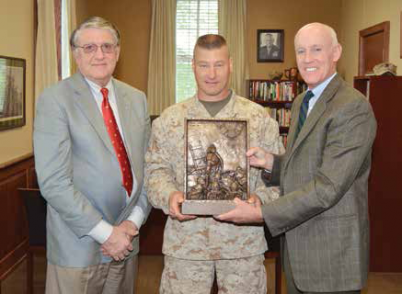 The Hulbert Award for the Marine Gunner of the Year, named after the first Marine Gunner, Henry L. Hulbert, was crafted by former Leatherneck artist and veteran Marine John Chalk. 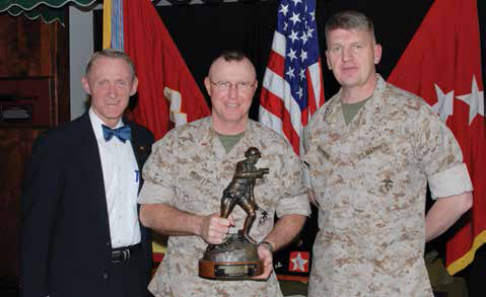 The initial trophy, presented to TBS in 2008 for display by the MCA&F CEO, MajGen Les Palm, USMC (Ret), left, is held by CWO-5 David R. Dunfee, who coordinated the development of the award for the Deputy Commandant, Plans, Policies and Operations, LtGen Richard F. Natonski, right. 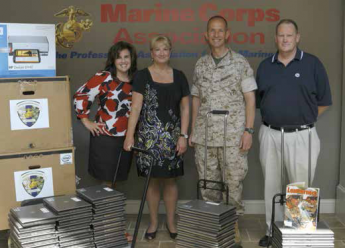 Hewlett Packard laptops are ready for delivery to wounded Marines in 2011. From left: Barbara Lewandrowski, Wounded Warrior Regiment; LeeAnn Mitchell, Director, Events and Corporate Sponsorships, MCA&F, who coordinated the laptop donation; Col John L. Mayer, Commanding Officer, WWR; and Greg Lockett, Hewlett Packard. Shouldn’t the Marine Corps do these things? Yes, it probably should, but laws prohibit the use of appropriated money for certain things. The MCA and its Founda­tion fills this important gap. It always has been that way. For example, in 1915, the Corps’ inspec­tor general recommended that the MCA purchase flowers for Marines buried at Arlington National Cemetery. In 1918, the Association bought bronze plaques to place on Navy destroyers named after Marines. The MCA Foundation was in its infancy when MajGen Usher took over in 2010. It now sponsors programs that help active-duty Marines and attracts the funds to pay for them. In 2012, the Foundation provided 300 unit libraries (mostly books from the Commandant’s Professional Reading List)and more than 8,000 awards to Marines in its significantly expanded Marine Excel­lence Awards Program. “The money we take in goes into our programs to support Marines. If a Marine commander comes to me, and I start say­ing no, we’ve got a problem,” said MajGen Usher. “We’re also not competing with other Marine organizations. I don’t want to take money away from the Scholarship Foun­da­tion or our world-class museum,” said MajGen Usher. “We’re all dedicated to support an institution that we love. MCA membership today is about 77,000, mostly active, retired and vet­eran Marines but with some mem­bers from other U.S. Armed Forces. The Association’s charter rules out some individuals who would join to support the Corps. With the creation of the Foundation, nonveteran Marine parents and “friends” of the Marine Corps now can get on board as members of the Foundation, helping ensure a strong MCA&F. The policy is paying off. The Corps’ “friends” are joining and becoming leading customers in the MCA’s e-commerce trade via the Internet. People place orders with the MCA’s online store and call cen­ter in Bartlett Hall. When MajGen Usher completes a planned website improvement effort, it will be even easier to make a purchase, join the Association and Foundation and access Marine-related content. The MCA&F presently has a successful Group Benefits (insurance) program and offers financial planning, banking services and other insurance products through an affinity partnership with USAA. These offerings are a steady source of assurance for Marines who want to ensure their families’ well-being should something happen. When the well-known source of Marine uniforms and equipment, The MARINE Shop, became available after the death of its founder, retired Major Harry Elms, the MCA, led by its CEO, MajGen Les Palm, stepped in and purchased it in 2007. The popular retail uniform store on the corner of Broadway and Potomac in Quantico town was renovated and now makes it even easier for Marines to wear the best-fitted uniforms. The MCA also opened a very popular retail store at MCB Camp Lejeune, N.C., built a new annex to its headquarters in Quantico and initiated a series of professional dinners, including awards dinners, and launched the Marine Corps Association Foundation during MajGen Palm’s tenure as CEO. Master tailor Nhean Keo is one of many world-class tailors who assist Marines at the MCA&F’s The MARINE Shop in downtown Quantico, Va. The MARINE Shop appeals to all grades, and with The Basic School located at Quantico, many Marine second lieutenants become career-long customers. 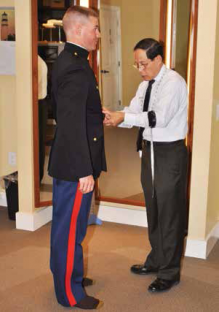 The MARINE Shop’s expert tailors visit the U.S. Naval Academy, Officer Candidates School and several Naval Reserve Officers’ Training Corps units. In 1972, when the Department of Defense closed out the option of assigning active-duty personnel to military-related associations, the Marine Corps Association shifted from an organization staffed large­ly by active-duty Marines to a civil­ian work force, but the focus on supporting Marines continued to gain momentum. Gen Louis H. Wilson, the future 26th Commandant, was the MCA’s last active-duty leader. He ordered a management study, and retired Marine Colonel Bevan G. Cass be­came the MCA’s first executive director. The tireless, square-jawed, crew-cut executive had to make the Association profitable in order to continue needed programs supporting the Corps. Cass improved the MCA Bookstore, pro­cured a printing press and shipped Ma­rine Birthday Ball supplies to Marine units. Operating from an old temporary building near Quantico’s Butler Stadium, he set the business tone for his successors. The Association and the Marine Corps Gazette have been almost synonymous since the Association’s founding. Leather­neck magazine took another course to today. In 1917, two enlisted Marines re­ceived per­mission from Brigadier General Le­jeune, the Quantico commander, to publish a paper for Marines. In time, it became Leatherneck magazine. Leatherneck grew to a colorful 64-page monthly in 1926 with photos, jokes, cartoons, poetry and reports from the field. Its popularity con­tinues to this day. In World War II, the magazine’s notoriety elevated it to a monthly circulation of 300,000. The Leather­neck Association was incorporated in 1943 when it added the professionally enriching, red-covered “Guidebook for Marines” to its offerings. During the Vietnam War, circulation was at 200,000 monthly. The Leather­neck staff, numbering more than 100 in Washington, received a Meritorious Unit Commendation for its service during the period. 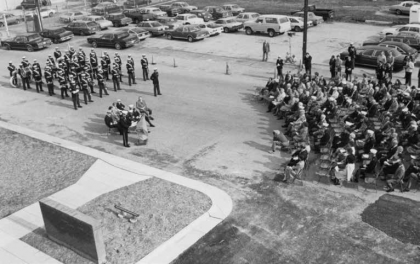 The Leatherneck Association moved its offices from Henderson Hall, Arlington, Va., to Quantico in 1975, but, with the loss of its Marine active-duty staff, more dramatic change was needed. The Kelley committee discovered that both associations had their own book service, magazine, insurance plan and awards program. Although more people read Leatherneck and the “Guidebook for Marines,” and its insurance program was popular, the Leatherneck Association, by merging with the Marine Corps Associa­tion, could obviously support the Corps more effectively. The current home of the MCA&F, Bartlett Hall, aboard MCB Quantico, Va., was named for former Executive Director BGen George Bartlett and dedicated on Nov. 10, 1986. When retired BGen George L. Bartlett took over in 1979, the MCA headquarters was located in what is now Butler Hall (Building 1019), not far from Quantico’s railroad station. But this headquarters couldn’t house all of the MCA’s activities. Operating from his hip pocket, he made things happen. He opened communications with the State Department, shipping Birth­­day Ball supplies to Marine embassy de­tachments around the world. The MCA stepped in to run the Marine Corps Mara­thon for eight years. Then a series of mail campaigns were launched to promote the MCA and its professional magazines to active-duty and other Marine communi­ties. The MCA’s printing press located in Quantico town seldom stopped rolling. With operations taking off, it was time to consolidate operations under one roof—it was time to build a permanent home. The Kelley committee recommended that the MCA headquarters be constructed at Quantico. BGen Bartlett handled the detailed negotiations and closely super­vised the building project. The building, appro­priate­ly named Bartlett Hall, was dedi­cated in 1986 on the Corps’ 211th Birthday. The MCA staff, now able to easily conduct staff coordination, became an even more effective team. Initially, the merger was not popular with the Leatherneck staff. Things improved immediately when BGen Bartlett’s talented MCA deputy, retired Marine Col William V. H. White, became Leatherneck’s editor. “I did more for the Marine Corps in that Association than I ever did as a general officer on active duty. I’m proud to be a part of it,” BGen Bartlett said. LtGen Anthony “Tony” Lukeman took over in 1989. (His son, BGen James W. Lukeman, currently commands the Sec­ond Marine Division at Camp Lejeune.) LtGen Lukeman computerized the MCA and kept the business side going, but he took pride in reading every word before both magazines were published. “I was thrilled to be in the company of writers. There is nothing more important than informing Marines,” said the soft-spoken retired Marine. The Marine Corps Gazette has been the professional journal of Marines since 1916. Col Lejeune wrote the first article. Starting as a quarterly and becoming a permanent monthly in the mid-1940s, Marines have exchanged ideas in Gazette before every major Marine Corps ad­vance­ment—amphibious operations, helicopters, maritime prepositioning, etc. “We have an ethos of innovation, and the Marine Corps actively seeks input from Marines,” said retired Marine Col John Keenan, the professional journal’s editor. Keenan reads all submissions and per­sonally accepts or rejects most articles. When in doubt, he sends articles to the Gazette editorial board member with subject-matter expertise. The full 14-person board votes on sensitive items and all writing contest submissions. Keenan is trying to debunk the myth that Gazette is an officers’ magazine. The Gazette’s diverse active-duty audience begins at the lowest enlisted grade, grows at the NCO level and goes up to the Com­mandant. Enlisted Marines won several writing contests in recent years, and many had their articles published. One new MCA&F award is the Sergeant Major of the Marine Corps Writing Award that honors the top Gazette article written by an enlisted Marine. SgtMaj Barrett said that with each promotion, Marines spend more time writing, and they must learn to write clearly and persuasively. “Our Marines need to practice and de­velop writing skills through daily use. This award recognizes enlisted Marines for that commitment,” he said. Only a few young Marines read printed newspapers, and most receive their news from smartphones or tablets. The MCA is preparing for this evolution in reader­ship. Digital editions of both Gazette and Leather­neck are available monthly for online readers, and plans are underway to make the digital content even more user-friendly for smartphone and tablet users. The focus will be on providing content attractive to members and other readers and in the format preferred. “Our younger readers want to read online. Other readers prefer the current paper version, and some will do both. Our challenge is to accommodate everyone,” said Keenan. Right now, about 14,000 members elected to forego the print editions, reading the digital editions online. The online-only readership will grow in the years ahead, and the magazines are making preparations to meet changing preferences. The Marine Corps and its professional Association were joined at the hip for the past 100 years. Since the MCA went private, the two have marched side by side, each having the other’s back. That journey should never end. With a recent 17-year lease, the MCA headquarters will remain at Quantico at least through mid-2026. The MCA has the freedom to support Marines in many ways today, and its new Foundation gives it potential to do even more. What a century! But, the best is yet to come. By Arthur P. Brill, Jr.